ALABAMAWORKS! 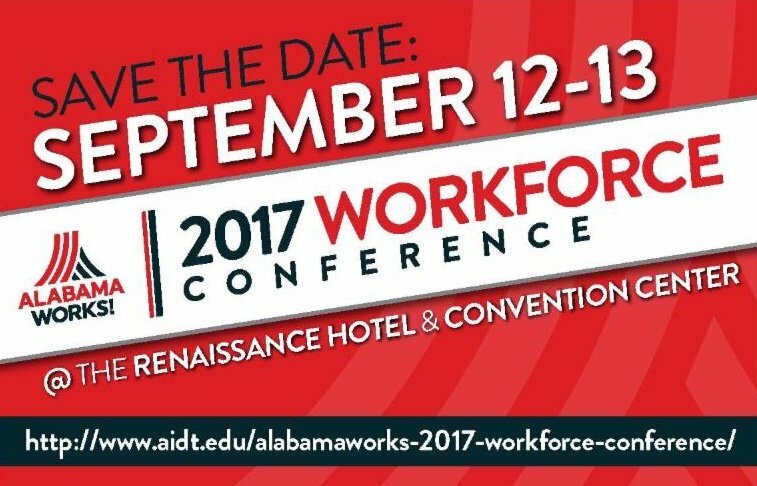 UPDATE NEWSLETTER - JULY 2017 - AlabamaWorks! 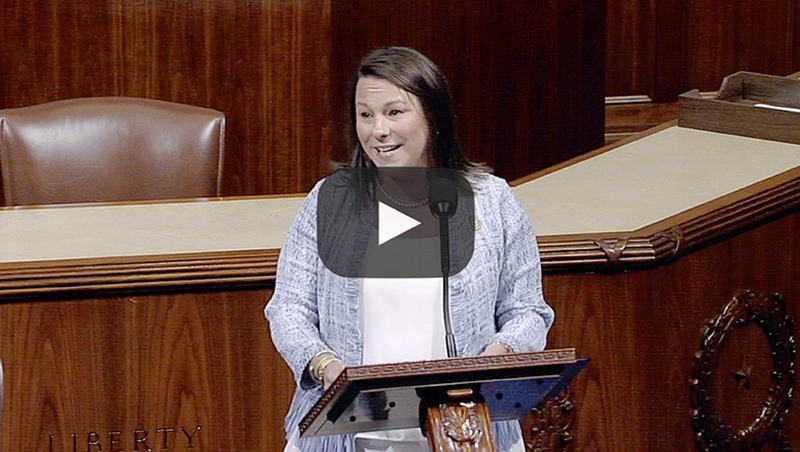 U.S. Rep. Martha Roby (R-Ala.) recently spoke on the floor of the U.S. House of Representatives on the importance of career and technical education. Supporting CTE helps connect students with rewarding careers and boosts local economies by enhancing the workforce, said Roby. Congresswoman Roby’s speech was in support of legislation in the House to reauthorize funding for career tech programs at community colleges, vocational schools and high schools. In her speech, Roby highlighted her recent visits to successful career tech programs in Tallassee, Geneva, and Dothan. Roby also spoke of efforts to dispel unfair and unhelpful mischaracterizations of careers in the skilled trades. “When it comes to higher education, we all know there has been a silent stigma attached to not completing an academic degree at a four-year university. For years, we were afraid to say that college isn’t for everybody, when the truth is career tech programs can actually lead many Americans to a better quality of life,” she said. H.R. 2353, the Strengthening Career and Technical Education for the 21 Century Act, authorizes $5.9 billion for career tech programs over the next five years, with an additional $1.2 billion in 2023. The bill also simplifies the application process, provides greater flexibility to program administrators so they can adjust to changing needs, improves accountability requirements to ensure programs deliver results, and ensures a limited federal role in education. To watch a video of Roby’s speech, click the image below. Roby also authored a column on career technical education that ran in The Montgomery Advertiser. Read it here. 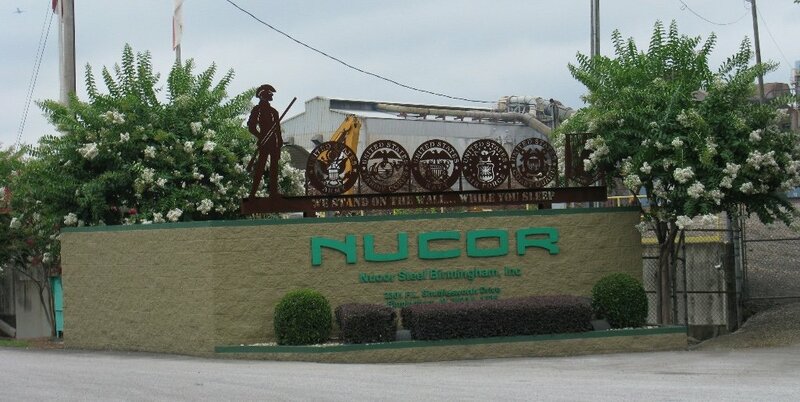 Nearly 40 high school career coaches and other educators gathered at Nucor Steel in Birmingham on June 14 for a “Career Coach Day” hosted by the Alabama Iron & Steel Council (AISC). Industry representatives and human resource professionals were there to discuss one of the primary challenges that really keep them up at night: an aging workforce coupled with severe shortcomings in new, skilled candidates. Similarly, the career coaches were able to ask questions about how to better prepare high school students for a career in iron or steel manufacturing. The Career Coach Day was the first event of its kind in Alabama. Clark and others at the event said it is a model that should and will be replicated throughout the state. Most of the career coaches were from the Birmingham area, but some came from other parts of the state where iron and steel manufacturing has a significant presence. They gained insight into what career advancement in iron or steel manufacturing looks like. They learned about the average “teammate” as they are often called, who has been at his or her facility for more than a decade and earns more than $90,000 per year. The Alabama Iron & Steel Council operates independently under Manufacture Alabama, the state’s only trade association dedicated exclusively to manufacturers and their supplier/vendor partners. AISC member companies include AM/NS Calvert, AMERICAN Cast Iron Pipe Company, CMC Steel, McWane, Inc., Nucor Steel, O’Neal Industries, Outokumpu Stainless, SSAB Americas, U.S. Pipe & Foundry, United States Steel, Alabama Power Company, Blastcrete Equipment Company, Colburn Construction, Inc., ERP Compliant Coke, M&B Metal Products, OMI-Bisco Refractories, Reno Refractories, Southeast Gas, Southern Alloy Corporation, and Taylor Machine Works, Inc.
Alabama’s unemployment picture continued to improve in May, dropping to 4.9 percent — a half percentage point lower than the previous month. It’s the state’s lowest jobless rate since March 2008, before the Great Recession. May’s 4.9 percent unemployment rate is down from April’s 5.4 percent, and nearly a full percentage point from April 2016’s rate of 5.8 percent. The number of unemployed Alabamians fell by nearly 12,000, going from 119,113 in April to 107,364 in May. Gov. 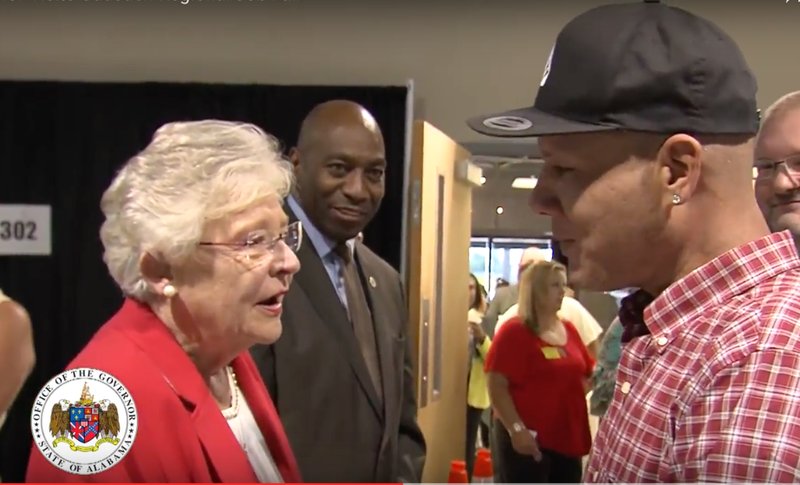 Kay Ivey was on hand to officially open the Gadsden Regional Job Fair on June 27. About 800 job seekers attended the Regional Job Fair, which featured 100 employers with more than 3,200 jobs available. The Alabama Career Center System, in partnership with WBRC/Fox 6 News and the City of Gadsden, hosted the job fair, held at 210 at the Tracks in Gadsden. Some of the employers who took part in the job fair were American Apparel, Decatur Plastic Products, the Federal Bureau of Prisons, Honda North America, Huron Valley Steel, KTH Leesburg Products, law enforcement agencies and the U.S. armed services. Gov. Kay Ivey and Labor Secretary Fitzgerald Washington greet job seeker at Gadsden Regional Job Fair. Click image above to watch Gov. Ivey’s video. 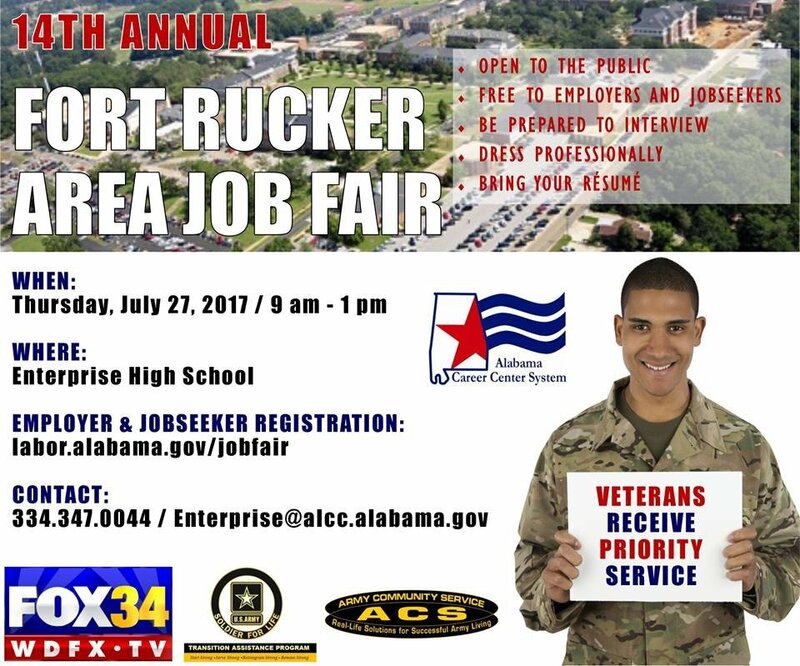 The Alabama Department of Labor is holding a large regional job fair on July 27 in Fort Rucker. Please see the flyer below for more information. Employers and job seekers should register at www.labor.alabama.gov/jobfair. For a listing of other job fairs, please visit www.joblink.alabama.gov. The Alabama Career Center System, partnering with other area agencies, will host a series of job readiness workshops and job fairs in Thomasville and Butler to fill open positions at Golden Dragon Copper in Pine Hill. Golden Dragon is hiring for dozens of positions at its Pine Hill plant. All applicants must have a resume. Resume assistance will be provided at the job readiness workshops or at the Demopolis or Jackson Career Centers prior to the job fairs. Here are the times and locations for the workshops and job fairs. Tuesday, July 18, 9 a.m.-noon and 1-4 p.m.
Thursday, July 20, noon – 5 p.m.
Tuesday, July 25, 9 a.m.-noon and 1-4 p.m.
Thursday, July 27, 10 a.m.-4 p.m. The workshops are free and open to all who are interested, but registration is strongly encouraged. Please contact the Demopolis Career Center at 334-289-0202, the Jackson Career Center at 251-246-2453, or Wilcox Works at 334-682-6366 to register or for more information. These events are hosted by the Alabama Department of Commerce, the Alabama Department of Labor/Alabama Career Center System, Alabama Cooperative Extensions, Choctaw County Board of Education, Choctaw County Chamber of Commerce, Choctaw County Commission, City of Butler, Clarke County Economic Development Agency, Thomasville Chamber of Commerce and Wilcox Works. J.D. Henry founded the Henry Brick Co. in 1945 with one goal in mind: to take the rich clay of central Alabama and produce brick of unmatched beauty and unsurpassed quality. For more than 65 years, family-owned Henry Brick Co.’s unique product line has been renowned throughout the Southern, Eastern and Midwestern United States. 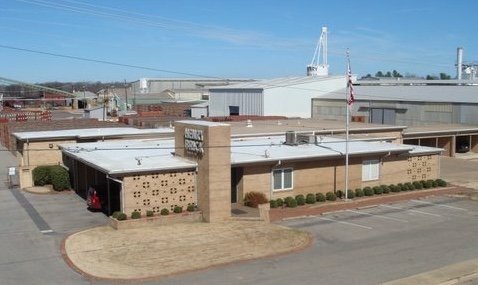 Henry Brick is located in Selma and employs approximately 60 people. In order to be successful, the brick industry must ensure that product samples are available in showrooms for potential customers to view. The process of manufacturing and supplying the sample product boards at no charge to vendors and showrooms across the nation must be completed in an efficient manner. During the sample board manufacturing process, a growing source of revenue known as thin brick is produced. Demand for the thin brick product is expected to increase in the future. Due to the rising demand for all brick samples and the thin brick product, in particular, the company needed to streamline its sample board manufacturing process. ATN lean practitioners worked with company employees to conduct a three-day Cellular Manufacturing Kaizen Event. All company participants were educated on the of five-step cellular process and the team participated in each of the five steps. Step 2: Assess demand and determine task time. Step 3: Review work sequence (conduct time studies). Step 4: Combine work in balance process. Step 5: Design cell layout. Reduced operator travel distance by 3,864 feet/day. Reduced picking time from 4.5 minute/sample to about 2 minute/sample. Reduced assembly time by 3 minutes. Created a schedule tool to balance operation based on demand. Increased thin brick production by 10 times, resulting in $20,000 in increased revenue without hiring additional staff. For more information about the Alabama Technology Network, visit www.ATN.org. 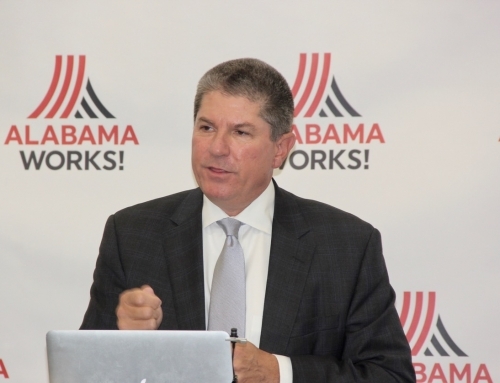 Alabama’s newly restructured and revamped workforce development system went pubic in November 2016 with well-covered media events in Birmingham and Montgomery. Television stations, newspapers, online media and business magazines ran prime stories touting the new AlabamaWorks as the go-to, centralized starting point for everything workforce related — from industry looking for workers, to job seekers looking for work, to students and other individuals looking for a promising career. 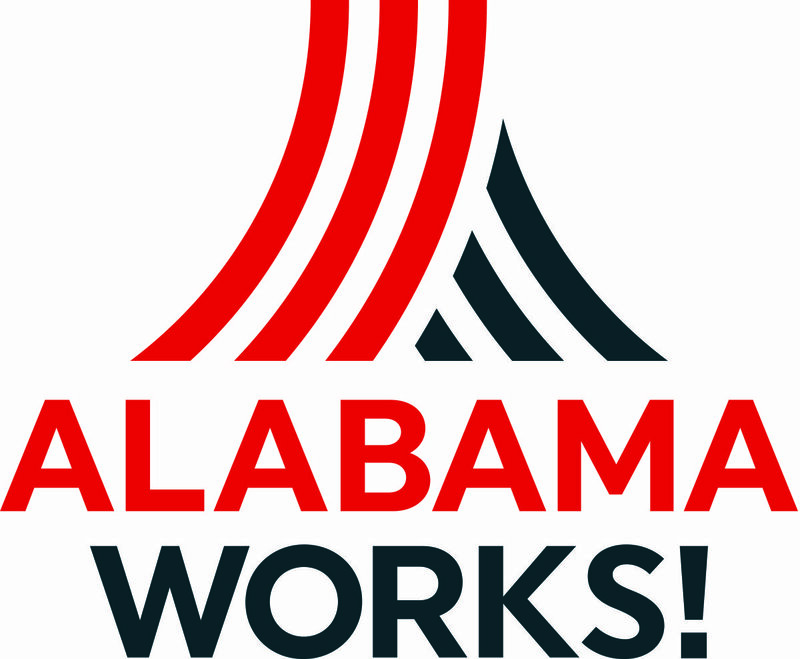 Since then, the AlabamaWorks brand has continued to grow. A paid advertising campaign featuring TV, radio, newspaper and Internet ads launched in early spring and blanketed the state. That was followed by more localized ads focused on AlabamaWorks’ seven regional components, promoting them as the go-to place in each region for workforce development assistance. In addition, public events and announcements by the industry, state and education partners that are at the heart of AlabamaWorks continued to make headlines around the state. These included, as just a few examples, large regional job fairs organized by the Department of Labor, industry/government partnerships and new programs involving the Alabama Community College System, K-12 and AIDT. 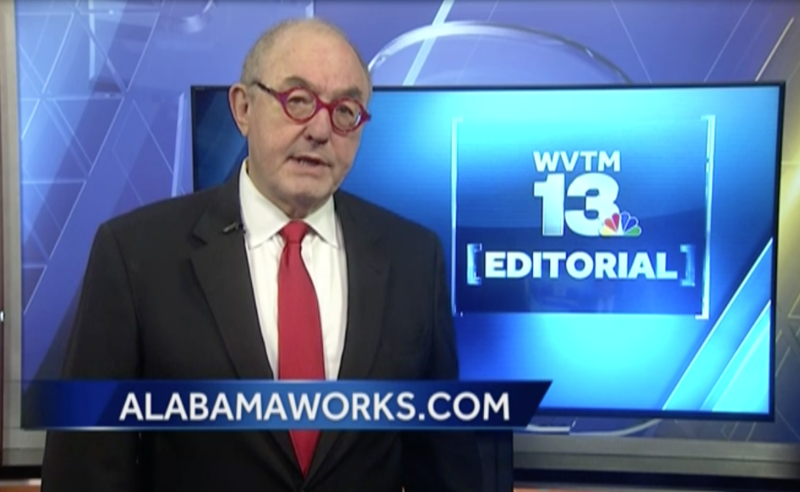 Recently, Hank Price, general manager of WVTM/Channel 13 in Birmingham, did a special editorial praising AlabamaWorks. Click on the image below to watch it. 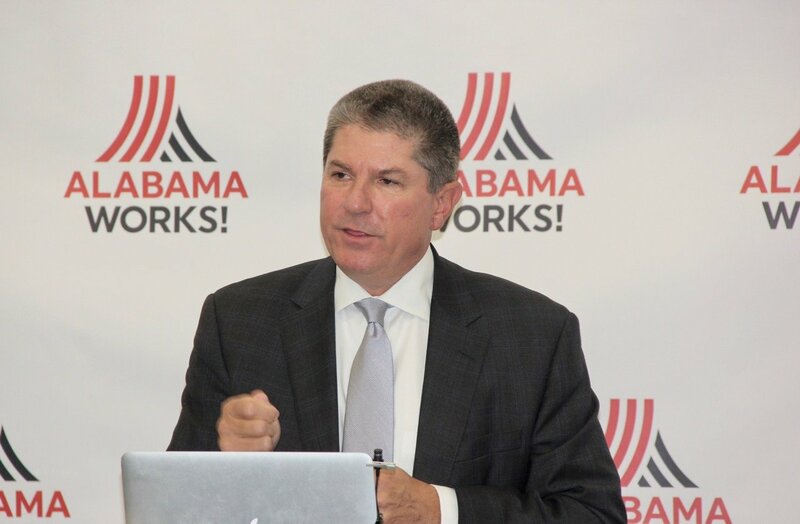 Another element in building the brand recognition of AlabamaWorks and the Regional Workforce Councils are media blitzes and tours that began this spring in North Alabama. 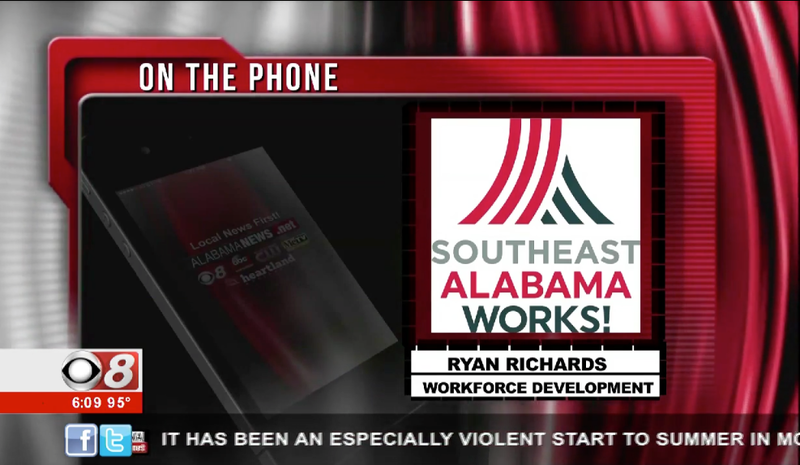 Following on the success of the North AlabamaWorks media blitz, which resulted in more than a dozen newspaper articles, television stories and guest appearances on TV and radio featuring Executive Director Micah Bullard and Assistant Director Stephanie McCulloch, the roadshow recently hit Southeast Alabama. In the past month, Southeast AlabamaWorks Executive Director Ryan Richards and Direct Communications’ Suzanne Anderson visited five Wiregrass-area newspapers. They are Elba Clipper, Southeast Sun, Opp News, Luverne Journal and the Troy Messenger. Read the Troy Messenger story here. Richards also was featured on TV news. Click the image below to watch a newsclip featuring Richards’ interview. 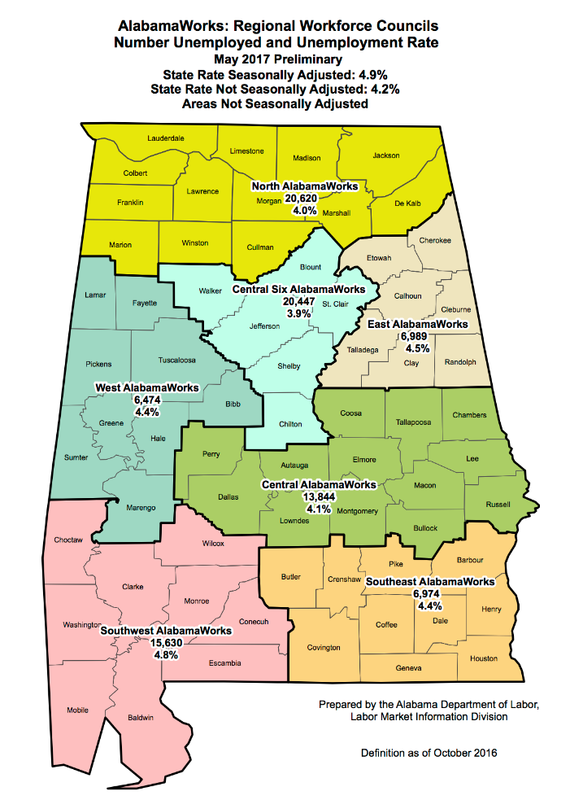 The Southeast AlabamaWorks media blitz will continue in August. Alabama has more than 3,000 open manufacturing jobs due to the lack of core job skills required to work in manufacturing. Companies have been compensating for workers that lack these skills by developing their own internal job skills training. Manufacturers that cannot afford to take this approach end up with high attrition rates, which are very costly and have negative impacts on their key performance indicators, such as safety, efficiency and quality. To address the manufacturing skills gap in Alabama, the Alabama Community College System is implementing the Manufacturing Skills and Standards Council’s (MSSC) Certified Production Technician (CPT) certification program at all of the community colleges across the state. More 40 instructors have been authorized in the past two months to begin instruction, and several colleges are planning to begin programs as early as this summer and into the fall. 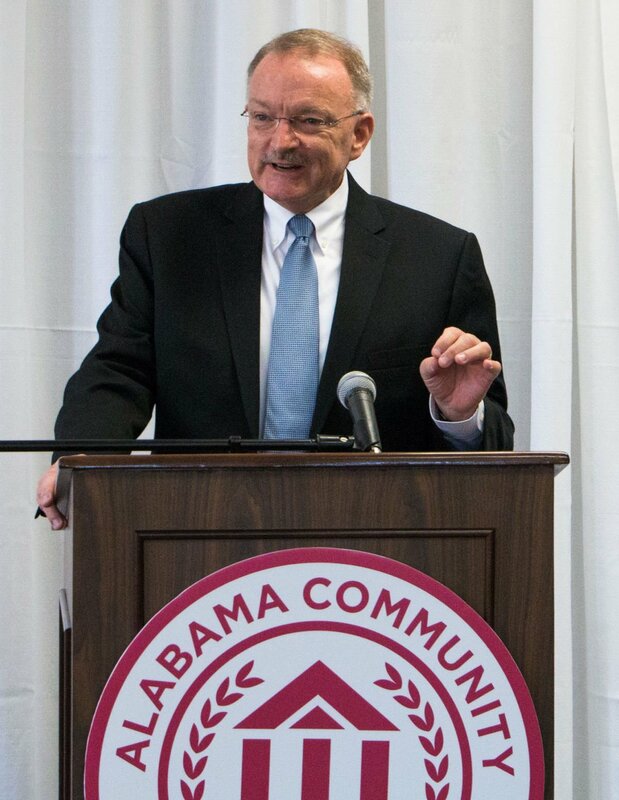 “Our business and industry partners across the state provide us with consistent feedback that finding qualified workers ranks as one of their top concerns in achieving success.” said Jeff Lynn, vice chancellor of Workforce and Economic Development for the Alabama Community College System. “Our hope is that this initiative will provide those students with the necessary skills and training to go immediately to work for one of the many manufacturers in our state offering them a good quality of life and a rewarding career or leads them to further their education in one of the many career pathways that the MSSC CPT credential supports, such as engineering, automation, electronics, industrial maintenance and welding,” said Jimmy Baker, chancellor of the Alabama Community College System. Candidates who pass all four modules receive the Certified Production Technician (CPT) certification. MSSC CPT has been endorsed by the National Association of Manufacturers for the core skills of all production workers and is accredited under ANSI-ISO 17024 (Personnel Certification), making it the only national certification body globally with this designation for manufacturing. Healthcare occupations are one of the top high-wage, high-demand jobs in every workforce region of Alabama. To address this need, the Alabama Community College System is offering several new health-related program initiatives that could potentially impact large numbers of students and fill workforce needs in multiple healthcare professions, especially nursing. As part of a new initiative to improve nursing education and workforce production, ACCS has partnered with Jacksonville State University to create an improved environment for faculty and students. A part of this partnership is the creation of a career pathway for nursing students to progress in their academic careers and reach higher levels of achievement within various levels of the nursing profession. This pathway is currently offered at two ACCS schools: Gadsden State Community College and Snead State Community College. ACCS is also working on possibly expanding healthcare career pathways in a relationship with the Alabama State Department of Education and JSU to fill other high-wage, high-demand careers such as respiratory therapy and occupational therapist assistant. TechMGM, a collaboration between local industry, education and government, is holding a second class of CompTIA Security+. The course is offered by the Alabama Community College System and is being delivered in a boot-camp-style format preparing students to test for the Security+ certification as quickly as possible. The Security+ Boot Camp began July 10 in downtown Montgomery and takes four weeks. The course, held Monday through Thursday, prepares students to attain the CompTIA Security+ certification, which is one of the most sought-after qualifications for IT workers looking to work with the military. The first Security+ class consisted of 15 members and concluded June 28, resulting in students prepared to take the CompTIA Security+ exam. “We answered the call from our community, bringing industry recognized certification courses to the Montgomery area to assist with unfilled IT positions,” said Barry May, deputy director of workforce and economic development for the state’s community colleges. For more information on TechMGM and training, go to www.techmgm.com. 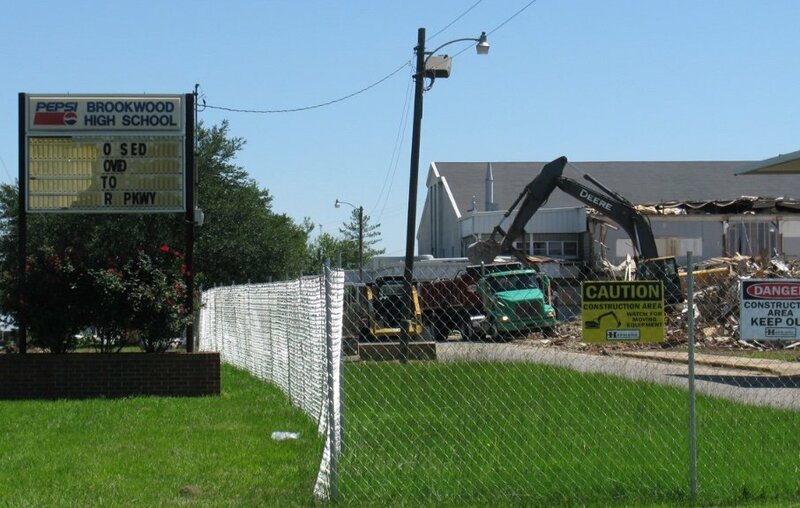 Crews this summer demolished part of the former Brookwood High School in Tuscaloosa County to make way for a new workforce training center. The new center is funded by a $1.5 million grant from the Appalachian Regional Commission to the West AlabamaWorks/Region 3 Workforce Development Council for the WAW 2020 Initiative. The center will provide job training to fill workforce needs in the automotive, advanced manufacturing, healthcare, hospitality and other industries in western Alabama. Its primary focus will be to assist those impacted by layoffs in Alabama’s coal-mining industry by helping prepare individuals for new job opportunities. West AlabamaWorks is partnering with Shelton State Community College, the Tuscaloosa County and Tuscaloosa City school systems and others in the venture. Although part of the high school was torn down, other parts of it will be renovated and fitted with up-to-date industrial training equipment. 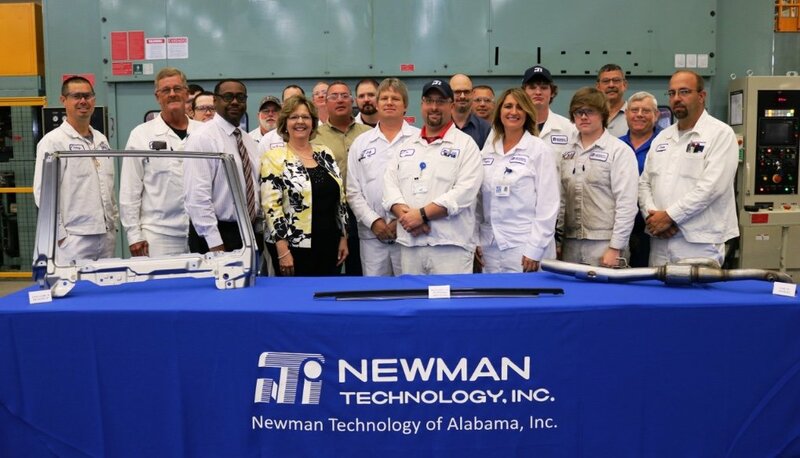 Newman Technology of Alabama Inc., an expanding automotive parts supplier in Albertville, recently became one of the newest partners of Apprenticeship Alabama. Newman Technology is one of four operating divisions of Sankei Giken Kogyo Co. Ltd of Japan in North America. It supplies door sash, exhaust systems and window trim products to OEM manufacturing facilities in Alabama and surrounding states. The company broke ground on its original 140,000-square-foot manufacturing facility in 2012, is nearing completion of its third building phase and recently kicked off yet another building phase. For more information about Apprenticeship Alabama, go to www.apprenticeshipalabama.org. Apprenticeship Alabama Manager Frank Chestnut, third from left, joined Newman Technology officials and apprentices for a signing ceremony at the company. Trump Signs Executive Order on Apprenticeships. The Hill, Washington, D.C.